This is our popular complete fitting kit to hook up your Fullblown dual pump kit. Note: We only offer this kit with red/blue fittings and stainless steel hose, or black fittings with stainless steel hose. However the only fittings we don't have in black will be the two fittings that attach to the fullblown top hat. We only carry those in red/blue. 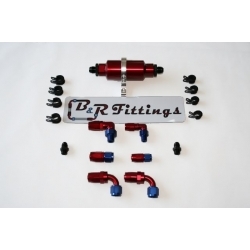 Note: This kit is specific to 1992-2000 honda civics and 1994-2001 acura integra with b, d or h series motors. If you need a custom setup please give us a call.